Ali Husain Mir is a writer and a university professor in the United States. Apart from his academic scholarship, he has been documenting the history of the Progressive Writers’ Movement in South Asia, and he is the co-author of Anthems of Resistance, a book on the Urdu poetry of the Indian subcontinent. 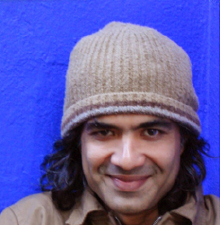 He has worked on a number of Indian films (“Bollywood”) and is the co-writer of Dor, a landmark movie described as “a rare film that will define the contours of the depiction of women in popular cinema in the future.” He has also written the lyrics for several celebrated Indian film songs, and for some New York City based bands. Ali is currently working on a screenplay based on the life of the writer Saadat Hasan Manto. Mee Raqsam (I Dance) — A young girl tries to overcome the grief caused by the untimely death of her mother by dancing. When the leadership of the local mosque demands that she stop dancing, her father will stand up for her right to do what she wishes.